Improve flexibility and streamline production. ControlSoft helps food and beverage manufactures boost the efficiency of their plants, optimize their processes, and respond more quickly to current market requirements while meeting the most stringent sanitary demands. We supply innovative technology solutions for food processing – find out how you can save energy and resources as well as cut operating costs, without compromising on product quality. Choosing ControlSoft gets you a team of dedicated project and support engineers with vast experience in the food and beverage industry. We offer a full range of project services to deliver the best product consistency. ControlSoft’s engineering team has developed a methodology for implementing advanced process control without disrupting your current operations; improve your plant operations in a safe, secure, and field-proven manner. See how our scalable process control solutions have helped food and beverage manufacturers achieve greater efficiencies, maintain product quality and consistency, lower lifecycle costs, with more flexible manufacturing. Our food and beverage control experts can help you deliver consistent, high-quality end products at an optimized rate, with strategies designed specifically for your application. Implement tighter temperature control to reduce off-spec product and improve product quality. Reduce temperature variations in your heating, drying, boiler and chiller systems. Deliver more consistent product, reducing over supply of value. Optimize production line startup control to effectively utilize equipment and increase throughput. Increase productivity by focusing on significant control issues and reducing maintenance costs. Streamline processes to reduce wear and tear on equipment, reducing downtime costs. Apply advanced process control strategies to increase productivity, quality, and consistency. The values that INTUNE spit out were nothing I thought I could ever use. But they were very close & then I was able to tune it very close. Well worth the cost of the software. Our system has been running very smoothly. 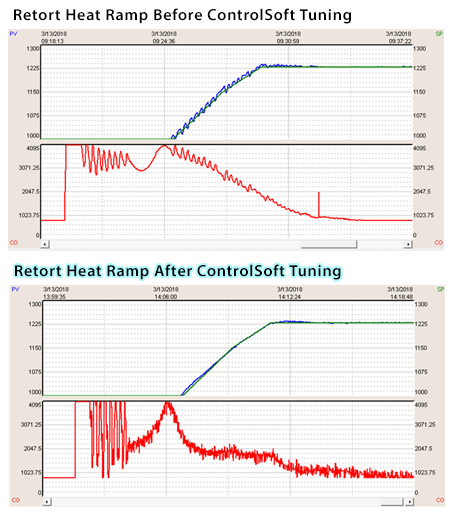 Temperature fluctuations are minimal, usually within + /- 1 degree C. This has been a vast improvement over the previous tuning parameters set by the manufacturer. Your tech support person did a great job, actually an awesome job… It was good to see how INTUNE did an impossible loop.